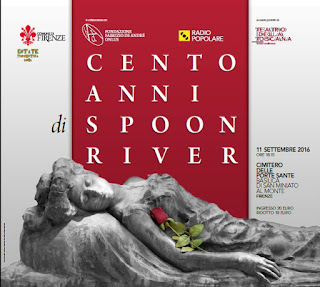 On September 11, 2016 at 6.15 pm a musical and theatrical play will take place at Cimitero delle Porte Sante (Basilica di San Miniato al Monte) in Florence. The event is dedicated to Edgar Lee Masters, American poet and dramatist, mainly known as the author of Spoon River Anthology. Music by Fabrizio De André. Readings by Marco Baliani, Iaia Forte, Gabriele Lavia, Maurizio Lombardi, Giulia Weber. Songs performed by Mauro Ermanno Giovanardi, Petra Magoni & Ferruccio Spinetti, Morgan, Peppe Servillo. Musical intermezzo by Trio Amadei, Markus Stockhausen, and Orchestra della Toscana directed by Saverio Lanza.